Antarctica is a continent of superlatives; the highest, the driest, the coldest, the most remote. This is the White Continent, a land of unending beauty and unrelenting extremes. It is harsh and unforgiving, yet tender and fragile. By an odd twist of the fate the most dangerous land in our world is also the most endangered. The Antarctic is the least inhabited place on earth but it is also may be the continent that is most affected by human activity. The reality of climate change is everywhere. Our world is interconnected and so the changes documented in Antarctica’s simple ecosystem foreshadow the effects of climate change on the more complex and complicated global bionetwork. Antarctica is our early warning system and the message is loud and clear. If climate change is affecting the ends of the earth then there will be a pronounced impact at its’ core. And that’s where the nearly 7 billion people who inhabit planet earth call home. But it’s not too late. 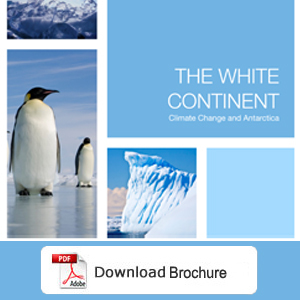 The White Continent: Climate Change and Antarctica is a stunning high definition portrayal of the beauty and bounty, conflict and challenges facing the world’s most remote region. Produced with unprecedented access to renowned scientists and researchers, intrepid Antarctic explorers and veteran expedition leaders, The White Continent includes rare access to the United States Antarctic Programs’ Palmer Station and epic scenes of the world’s last frontier.